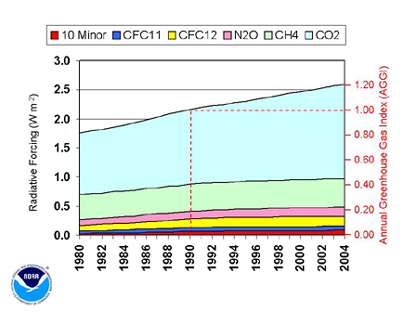 Greenhouse gases are on the rise  the data to support that trend have existed for years. But scientists say now that a new method of tracking the effects of the gases could lead to a more accurate understanding of their impact on climate change, which other scientists say the Arctic is already experiencing on a dramatic scale. Warmer temperatures are melting away Arctic ice. The temperature increase may be due to an energy imbalance posed by a rise in greenhouse gases, in addition to less ice to reflect the sun's heat away from Earth. Image courtesy of NASA. Researchers at the National Oceanic and Atmospheric Administration (NOAA) developed what they call a "scientifically unambiguous" index, that they say will allow them to track changes in the gases that contribute the most to the warming greenhouse effect. Their results, released on Sept. 27, show that these increasing greenhouse gases are causing an imbalance between the solar energy entering Earth's atmosphere and the energy going out, which can lead to warming of the planet. To create the Annual Greenhouse Gas Index (AGGI), NOAA scientists used measurements of greenhouse gas concentrations, recorded around the world since 1979. They accounted for only the main "long-lived" greenhouse gases that remain in the atmosphere and are uniformly mixed throughout the global atmosphere; those gases include carbon dioxide, methane, nitrous oxide and chlorofluorocarbons. "In this way the index is similar to the Consumer Price Index, which includes the most important commodities that reflect prices best," says David Hofmann, director of the NOAA Global Monitoring Division of the Earth System Research Laboratory in Boulder, Colorado, and a member of the research team that developed the index. The team converted the concentrations to a measure of how the gases change the difference between the amount of solar radiation entering Earth's atmosphere and the amount of energy leaving. The resulting index uses data from 1990 for its baseline comparison, which is also the same year that the international Kyoto Protocol uses to measure progress in the reduction of greenhouse gases. A higher AGGI implies a greater change in Earth's energy budget. "The AGGI will serve as a gauge of success or failure of future efforts to curb carbon dioxide and other greenhouse gas increases in the atmosphere," Hofmann says. This chart shows that the change in the difference between the amount of radiation entering Earth's atmosphere and radiation leaving Earth, or "radiative forcing," is increasing over time, due to rises in various greenhouse gases. Scientists are using data from 1990 as a baseline for comparison. According to the researchers, the 2004 index increased by 20 percent over 1990 values, mostly due to carbon dioxide. Hofmann says that interpreting the meaning of this change "is beyond NOAA's mission." There is nothing new about the data, which NOAA has been collecting for a long time, says Tom Wigley, senior scientist at the National Center for Atmospheric Research, Climate and Global Dynamics Division. But he says that the index provides a new way to visualize the data and makes it accessable to everyone. When the index is plotted on a chart, it helps people see that changing the energy balance drives climate change, Wigley says. "It's like putting your foot on the accelerator." 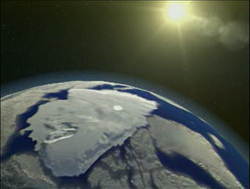 Mark Serreze, a senior research scientist at the National Snow and Ice Data Center (NSIDC) at the University of Colorado, Boulder, says that the increased greenhouse gas concentrations have spurred higher temperatures and acted as a kicker to the Arctic warming trend, which has led to a significant melting of the ice. The NSIDC reported on Sept. 28 that the extent of Arctic sea ice dropped Sept. 21 to a little over 5 million square kilometers, which is the lowest area measured since NASA satellites started taking data in 1978. From the data, scientists estimated that the Arctic loses ice at a rate of about 8.5 percent per decade. Serreze says, however, that greenhouse gasses are not the only reason for the declining ice. Patterns of natural variability such as the North Atlantic Oscillation  a cyclical climatic occurrence that alters weather patterns in the North Atlantic Ocean  as well as increased levels of cloud cover, are also contributing factors. "We're starting to see the effects of greenhouse gases," Serreze says. "But even if greenhouse gases are removed, you will always see variability." The minimum extent of Arctic sea ice in 1979 (left) was greater than the minimum extent in 2005 (right). NASA satellites have recorded a steady decrease in the ice since measurements began in 1978. Image courtesy of NASA. But the rising trend for greenhouse gases is not new; based on past data, the index has increased every year since NOAA's first measurements in 1979. Hofmann says that the Global Monitoring Division plans to release index updates each year beginning next April.